A scenic helicopter flight 1000 feet above the city or the coast is an unforgettable way to experience the breathtaking beauty of Melbourne and its surrounding areas. Fly over MCG, Eureka Skydeck 88, Rod Laver Arena, AAMI Stadium! 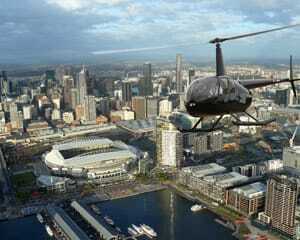 You can buy one or more seats on a thrilling 18-20 minute helicopter flight around the Melbourne CBD. Meet at the private lounge at Essendon Airport and be over the city in minutes, maximising your scenic flight time in the Helicopter with its luxury interior and Bose noise cancelling headsets. Your flight will take in the Docklands, Eureka tower, Rod laver Arena, The MCG, Exhibition Building, Eureka and MCG again before heading back to Essendon Airport. Flights available every weekend. We fit you together with other single passengers so you can experience the rush of this helicopter flight on your own or with friends. The perfect gift for birthdays, anniversaries or a wedding present! Maximum passenger weight for shared flights is 100kg. Maximum passenger weight for private flights is 125kg. Maximum combined passenger weight for 2 people in shared flights is 200kg. Maximum combined passenger weight for 3 people in shared flights is 280kg. Passengers with physical and/or mental disabilities must book on private flights and be accompanied by a carer in and around the helicopter. Pregnant passengers can fly in private flights only, at their own risk and are encouraged to consult their GP. Please note: No name changes are permitted once a booking is confirmed. Date/time changes can be made up to 48 hours before departure for an administration fee of $50 per passenger. If you fail to show at the booked time or on the booked day of your adventure we cannot offer a refund or credit. The Chief Pilot reserves the right to postpone a flight at any time in the event of adverse weather conditions. Seating requests will be taken into consideration and you will be seated in accordance with your weight and the relative weights of other passengers. If you wish to guarantee a specific seat we recommend you opt for a private flight. Shared flights are subject to minimum numbers. Shared flights will only go ahead when they are full. Passengers within 48 hours of their flight if their preferred session time has not filled. The supplier may need to shift flight times to match up shared passengers to create a full flight. Flights will only be conducted in safe weather conditions. Many factors such as wind, visibility, and rain can prohibit a safe and enjoyable flight. The supplier reserves the right to postpone flights, at the discretion of the pilot, on the day where the forecast and conditions do not permit safe and enjoyable flying operations. Itinerary of flight may vary at the pilot's discretion, dependent on weather and conditions on the day. ** Please note these are only available on Wednesday, Saturday & Sunday.